There is a new version (v1.1) of the Signing Savvy Member App available now for Android devices. The new versions fixes several bugs that were in the initial release of the Android app (hopefully it greatly reduces the crashes)! The Android app also improves the interface layout if you are using an Android tablet, such as the Samsung Galaxy tab. UPDATE - There is also a new version (v1.2) of the Signing Savvy Member App available now for Apple iOS devices (iPhone, iPad, and iPod Touch). The new version will properly update the sign of the day without the need to logout or quit the app. The new version also fixes a bug introduced in v1.1 that made the app unresponsive. If you are a full member, we encourage you to download the updated app! Hope you enjoy it and find it useful while you are away from your computer. If you are not yet a member, you can still use the app to view the sign of the day on your mobile devices. Sometimes it takes multiple seconds for the video to start when using flash cards. It may take until the second list. We have three lists so far. Everything now should be transitioned to the new server and working (both the website and iOS and Android mobile apps). The update should increase performance and overall make Signing Savvy a bit more snappy. If you do experience a problem, feel free to contact us. thanks for the update. i'm so glad you guys are staying on top of things. it's really great for those of us who love the site and the mobile app! 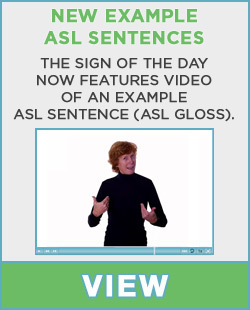 i'm trying to learn asl and signing savvy is a wonderful lifeline. :o) thank you again! We will be moving Signing Savvy to a new server this weekend. This may cause the site to be inaccessible for several hours. In reality, the transition should be much quicker (a few hours). We will begin the process late Friday evening when not many are relying on the site to minimize the downtime. Once the transition is complete, the new server will provide increased performance and a more reliable service for you. NOTE: The move will also benefit the Signing Savvy Mobile App. UPDATE (Saturday-Morning): We are in the process of moving the site right now. Some features may not work as we work through the move. Everything should be working again by Sunday at the latest. UPDATE (Saturday-Afternoon): Everything now should be transitioned to the new server and working (both the website and mobile app). We have been working hard on the Android version of the Signing Savvy Member App to make it as feature rich as its iOS counterpart. Well, we are happy to announce that version 1.0 of the Android version is now available! Just like the iOS version, the Android version of the Signing Savvy Member App is free for full members of Signing Savvy (available on the Android Market for Android 1.6 and newer devices). Just like the website, the app includes the ability to search for and view thousands of high-quality sign videos, build your own vocabulary word lists and share them with other members, view other members shared word lists, create virtual flash cards out of word lists to practice your signing, and much more ... all in a streamlined mobile interface. If you are a full member of Signing Savvy, you can login to the app and use all of its features. If you are not yet a full member, you can still use this free app to view the Signing Savvy Sign of the Day on your mobile device. After a great deal of work, we are happy to announce that version 1.0 of the Signing Savvy Member App is now available for Apple iOS mobile devices (iPhone, iPad, and iPod Touch)! The Signing Savvy Member App is free for full members of Signing Savvy (available on the Apple App Store). Just like the website, the app includes the ability to search for and view thousands of high-quality sign videos, build your own vocabulary word lists and share them with other members, view other members shared word lists, create virtual flash cards out of word lists to practice your signing, and much more ... all in a streamlined mobile interface. NOTE: An Android version of the Member App is coming soon. BlackBerry help coming any time soon? I use my BlackBerry, but currently, BB doesn't support Flash. Is there anything you can do for us poor, old, lonely BB people so that we can have handy access to signing assistance? Would you consider making it available to all users? Some aren't able to pay data plans and monthly fees for the app's assistance. We have kept our membership to the low price of $49.95 for a year and with that allow you access to many nice features including the printing capabilities, word lists, flash cards, and now the App. That is really a lot of features for less than 14 cents a day. Give it a try! Thanks for the feedback. We will have to look into adding that in the updates. I agree that would be a useful feature. Our focus right now is on completing the Android app. The Blackberry platform is not as capable as Apple iOS or Android. Moving forward though, we will continue to explore the possibility of bringing our app to a variety of mobile platforms. How do I update "sign of the day"? It still shows the sign from a few days ago. That did the trick. I don't know why I didn't think of it. Can't wait for it to be on the Android market! Yay! This app is WONDERFUL, I Can easily sit in class and pop up the word very quickly.I love SigningSavvy anyway this just makes it an extra bonus. Do you have an estimate on when this release will be? Looking forward to the droid app, i am member and its hard to view from the web page. rmflowers - this is a known bug in the current iOS app. This will be resolved in the next update to the app. In the meantime, you can update the sign of the day by logging out and back in. The new app for driod makes you sign in every time you go back to use it. Its a real pain to type in the full email and password. Other type of apps remembers that you are a member. The Android app does remember your login information. You should not have to login every time. I just checked on my Android device and it works as described. Make sure you are not clicking Logout (thinking it is Login). If you are having a problem with you app, fill out the Contact Us form with more details, such as the device model you are using.